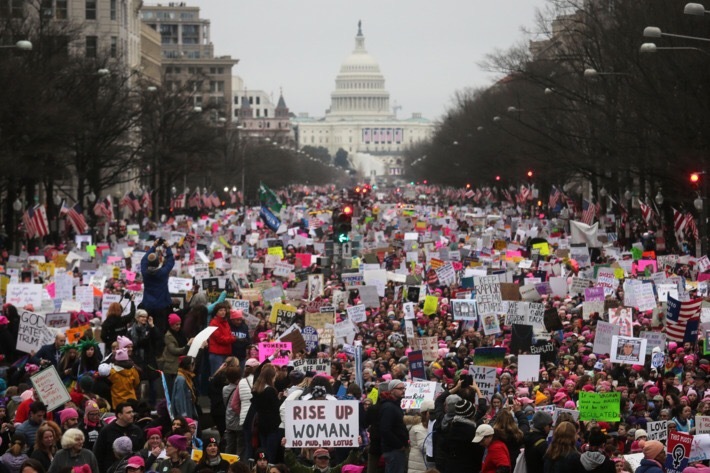 In the new age era of civil rights movements and protests came one of the biggest marches in the United States’ history: the Women’s March on Washington. While groups are still trying to count the amount of people that marched in protest, estimates have already reached over 2.9 million. Politicus USA (2017). This, however, does not consider foreign countries that also felt the need to participate in the cause for equality. Marches erupted in response to Donald Trump’s presidency, making him the most rejected man in a single day. Protests for women’s equality as well as people marching in solidarity with the Women’s March on Washington were seen on every continent. An estimated three times more people showed up in Washington, D.C., in protest than showed up to Trump’s inauguration. The New York Times (2017). According to the Metro General Manager, Paul J. Wiedefeld, “Metro recorded 1,001,613 station entries Saturday; by contrast, 570,557 trips were taken Friday, the day of President Trump’s inauguration as the 45th president.” WP Company (2017). The record setting day for the most trips taken is President Obama’s inauguration in 2009, with 1.1 million trips. WP Company (2017). Responses to this protest have been a mix between support and criticism. The most common criticisms to be heard are, “Why are women protesting equal rights? Nothing has been taken away from them,” as well as, “Women are equal, they need to quit whining.” Neither of these statements are exactly correct. In a research study done on the equality of women and men, “the achievement of full equality between women and men is one of the most important prerequisites for global prosperity and the advancement of society. The denial of such equality, in whatever form, perpetrates an injustice against one half of the world’s population and promotes in men harmful attitudes and habits that are carried from the family to the workplace, to political life, and ultimately to international relations.” Institute for Studies in Global Prosperity (2009). The truth of the matter is women are often seen as lesser, weaker, in need of more help, and are often told they are not capable of making the right choices even with their own bodies. Looking back in the history of the United States, women were not allowed to vote, work outside of the home, write books, enter colleges, or educate for professions deemed to be masculine (a majority of these being at graduate level). The only other group treated as badly [and worse] would be minority members. The tiers in society based on the level deemed worthy of rights starts with white males, minority males, white women, and then women of color at the lowest level of worth in America. This is not taking into account gender or sexual identity, which would just make things even murkier. While women have earned some equal rights, women tend to live in more poverty. In the book Lifetime Disadvantage, Discrimination and the Gendered Workforce (2016), co-authors, Susan Bisom-Rapp and Malcom Sergeant, tackle some of these issues with research showing how women tend to get paid less per hour than men do, how they are placed in lower paying jobs and have less opportunity for advancement and growth in the workforce. Women are often seen as the primary caregivers in home and family situations and tend to miss more work; also, their pregnancies are often seen by employees as an inconvenience. In predominantly female jobs (such as serving, cashiering, and caregiving), pay tends to be lower, whereas predominantly male jobs (such as doctors, scientists, plumbers, and construction workers) have wages that are higher. Additionally, when men move into jobs previously predominated by females, wages increase; however, when women move into jobs previously predominated by males, pay wages go down. “The problem unfolds over the working lives of women,” stated Bisom-Rapp. “Women’s experiences with education, stereotyping, characteristics other than gender like race and age, caregiving, glass ceilings, occupational segregation, pay inequality, part-time work, and career breaks over a lifetime make it difficult to amass the resources necessary for a dignified retirement,” says Bisom-Rapp. Women tend to retire with less social security income than men by roughly $4,000 a year; yet women also live longer, giving them a longer life of poverty. Although people claim equality between men and women exist, studies and facts show this is simply not true. The best way to put it is that women are seen as lesser than men, yet equal. One reason for this is because if the fact that women are viewed as lesser were to be acknowledge something would have to be done to ratify that, and by claiming they are equals, men can continue to enjoy the benefits of women being disadvantaged in society. This phenomenon is also common among majority and minority members where the majority claims equality, yet studies and facts show a treatment of inequality. As this inequality and disparity continues to exist among members in society, social justice reform will continue to be on the forefront of what people want. Protests and marching will continue and until a change occurs, people will not lay down their signs or retire their walking (or marching) shoes. Many members of the unequaled class will continue to take a stand while an unrest is beginning to stir among the people of the world. Easley, Jason. “Women’s March Is The Biggest Protest In US History As An Estimated 2.9 Million March.” Politicus USA. 21 Jan. 2017. Web. 23 Jan. 2017. “Equality of Women and Men.” Equality of Women and Men | Institute for Studies in Global Prosperity (ISGP). N.p., 8 Dec. 2009. Web. 24 Jan. 2017. Siddiqui, Faiz. “Women’s March Leads to 2nd-busiest Day in Metro History, Just Trailing Obama’s 2009 Inauguration.” The Washington Post. WP Company, 22 Jan. 2017. Web. 23 Jan. 2017. Wallace, Tim, and Alicia Parlapiano. “Crowd Scientists Say Women’s March in Washington Had 3 Times More People Than Trump’s Inauguration.” The New York Times. The New York Times, 22 Jan. 2017. Web. 23 Jan. 2017.